The Republic, something of a sequel to Townshend’s earlier book on the 1916 rebellion, is a fine history of the Irish independence struggle from 1917 to 1923. It was a novel take on the period, for me, because of its close consideration of the political as well as the military aspects of the struggle. By Townshend’s account the political aspects of the struggle were decisive in ensuring its success. By this account the refusal of Sinn Fein to take up seats in Westminster and instead establish an Irish parliament in Dublin was no mere empty gesture. Rather it was a political gambit to obtain Irish self-rule after efforts towards this end over the previous 75 years had been sabotaged by British and Unionist interests. The efforts of Collins in particular, Cosgrave and Stack to establish the “shadow state’s” finances, local government and courts gave even more concrete expression to the idea of a republic espoused by the first Dail, particularly in those areas where Irish military activity had destroyed British institutions and so carved out considerable space for nascent Irish political institutions to function. Mulcahy, in spite of his brutal decisions during the post-Independence Civil War, which included his support for the reprisal murder of prisoners of war, many of them former comrades from the struggle against the British, comes out of the account relatively positively as a man committed to civil authority and the establishment of democratic control of the army. Indeed, in the light of these principles those brutal decisions become much more understandable, though still repellant: at a certain level Mulcahy must have felt he was dealing with traitors to those democratic principles. The book reminds the reader of how history repeats itself, first as tragedy, second as farce. 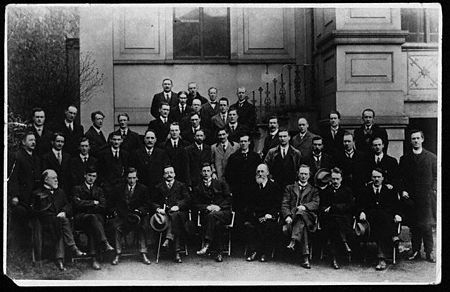 The Provisional IRA and post 1969 Sinn Fein aped many of the initiatives of the first Dail revolutionaries but with none of the substance: their political wing were “absentionist”, refusing like the first Dail members, to take their seats in Westminster if elected, without having the popular support or intellectual capacity to establish a “Shadow State” to replace the institutions which made British rule a reality. Most farcical they continued to claim legitimacy from the second Dail, all subsequent elections being “illegitimate” because of partition. In latter years, Adams and McGuinness made regular pilgrimages to the home of Tom Maguire, the last survivor of the 2nd Dail Executive, and hence in their eyes the “legitimate” government, to receive his imprimatur on political decisions and military initiatives. In a very real sense the Provisionals claimed divine right to wage war while the first Dail strove for democratic rights. I have a few quibbles with the book: Townshend persists with the hackneyed view that Collins had the option to run the ambush at Beal na mBlath rather than “fight into it”. Hence he concludes, unfairly I think, that Collins brought his own death on himself. (For more on this, if you’re interested, see my earlier blog, “Stop and we’ll fight them”) Elsewhere, perhaps more justifiably, he refuses to come to conclusions on key controversies of the period such as the circumstances of the final massacre at Kilmichael, or how many innocents were caught up in the killings of intelligence officers on Bloody Sunday morning. In both these instances he notes the controversies but does not come to a particular conclusion. Paradoxically though, while he is certainly familiar with it, he does not explicitly consider the material from the Bureau of Military History on the Intelligence war that underpinned Coogan’s, Dwyer’s and Foy’s assessments Bloody Sunday. Nevertheless the book is a fine account of the period combining narrative and thematic discussions to provide a compelling account of the period.